Saturday's open house at the Historic Duluth Armory Arts & Music Center is part of a thrust to restore and revive this historic building. The Armory not only was the home of the Army National Guard but also one of the main performance venues in Duluth of the past. Today the 1959 performance of Buddy Holly and his Winter Dance Party, just before he and the other performers died in a tragic plane crash, serves as its more notable claim to fame. 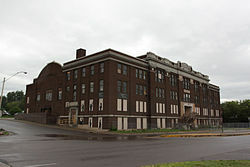 Today's Duluth News Tribune story (read HERE) recounts that Holly moment and the bright future ahead for preserving this history building. Susan Beasy Latto, originally from Hibbing and a classmate and friend of Bob Zimmerman (now Bob Dylan), was there the night Holly played at the Armory. I was there also and have written about it in previous posts. 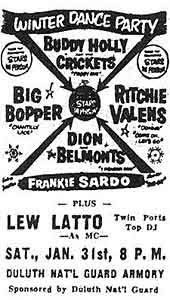 My childhood friend, Lew Latto, a precocious teen who later became a prominent local radio entrepreneur, was the promoter and MC of this event. Latto later met Beasy Latto at UMD and they married, not knowing each other at the Winter Dance Party concert. Dylan was there that night too and he spoke of it–now quite famously–as he received a Grammy award in 1998. It was a coming together of music of the past present and the future and sparks lore that now centers on preserving those magic moments. Of course many other famous people performed at the Armory... going as far back as Sergei Rachmaninoff, the great Russian pianist and composer. Johnny Cash, Liberace, Bob Hope, the Mamas and the Papas... and so many more followed. You can read more about the history of the Armory HERE on Wikipedia, at the News Tribune Attic HERE, on Zenith City Online and at the Historic Duluth Armory web site HERE. One of my weekly columns for the Duluth News Tribune (originally appeared on August 5, 1987) is reprinted on my blog HERE: Three Days Before the Rock Stars Died. And... you can check out some of my previous writings about the Winter Dance party HERE.